HomeCIE Seminar Series 2015 – Paradise lost: what can Nemo and co tell us about climate change and the connectivity of marine systems? CIE Seminar Series 2015 – Paradise lost: what can Nemo and co tell us about climate change and the connectivity of marine systems? ABSTRACT: One of the most anticipated climate-change impacts on our oceans has been poleward range shifts of marine species. However, evidence of range shifts has been sparse, partly due to the lack of long term scientific monitoring needed to detect latitudinal shifts. Here I describe an ongoing 15-year dataset on coral-reef fish assemblages from the southern Great Barrier Reef to southern New South Wales (Merimbula: 370S). We have recorded over 85 coral-reef fish species at sites in Sydney (330S) and 45 species from Merimbula, mostly damselfishes, butterflyfishes, wrasses and surgeon fishes. Recruitment of these species into temperate waters is sporadic, and partly related to East Australian Current characteristics and partly due to population dynamics at source and sink locations. Source locations are unclear, but related genetics, otolith and temporal settlement concordance data provide some information. However, despite variable arrivals, a key bottleneck to population establishment is overwinter survival, which is related to water temperature. I will outline what the dataset has revealed, and the linked experimental work on how physical and biological factors affect establishment of coral-reef species on temperate reefs. BIO: David Booth is Professor of Marine Ecology and Director of the Centre for Environmental Sustainability at UTS, and President of the Australian Coral Reef Society. 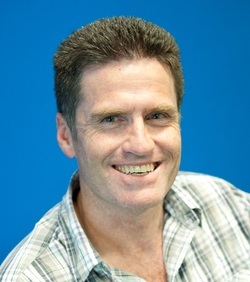 He has published over 100 papers in reef-fish ecology, climate change and other anthropogenic impacts on fishes and fisheries, in the Caribbean, Hawaii, Great Barrier Reef, and studies how tropical fish travel down the East Australian Current past Sydney. He researches fishes in estuaries around Sydney, the ecology and behavior of threatened fishes such as sea-dragons, black cod and white sharks and the ecology of the deep sea. He is also a strong advocate of sustainable fisheries and marine parks.